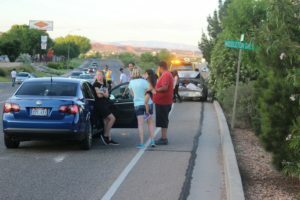 ST. GEORGE — Red Hills Parkway was slowed for about an hour Monday evening as a chain reaction collision between three vehicles severely damaged two of them. “This afternoon officers were in the area on an unrelated call and they observed a three vehicle collision at the intersection of Middleton Drive and Red Hills Parkway,” St. George Police Sgt. Johnny Heppler said. Heppler said a Ford Taurus heading northeast on Red Hills Parkway just before 8 p.m. slowed to make the left turn onto Middleton Drive and a Toyota Avalon stopped behind it. A Volkswagen Jetta came up behind and struck the Toyota Avalon, sending it into the back of the Ford Taurus. A family of four was in the Volkswagen Jetta, five people were in the Toyota Avalon, and the Ford Taurus was occupied by the driver only. An ambulance was originally dispatched, but Heppler said only minor injuries were reported and medical transportation was refused. The Toyota Avalon sustained the most damage, while the Volkswagen Jetta sustained front end damage. Both vehicles were towed from the scene. The Ford Taurus sustained minor rear-end damage and was able to be driven away. Traffic was forced down to one lane with officers directing traffic for almost an hour. The driver of the Volkswagen Jetta was issued a citation for following too closely. All occupants were wearing seat belts, Heppler said. dump hole with the auto business always dumping water out of their driveway and running directly onto middleton drive, what a crap hole. Are you talking to yourself again Dumpster? Feeling left out are ya ? the real question here: why would anyone want to drive a jetta? Hey ladybug you are cool. !!!!!! I’m still driving my Lamborghini around and my license plate is IH8TRealife. ha ha ha. !